Niagara Health continues to stand out when it comes to stroke treatment. Someone has a stroke every 10 minutes in Canada. Time is of the essence when treating a person suffering a stroke, which occurs when a blood clot blocks blood flow to the brain. 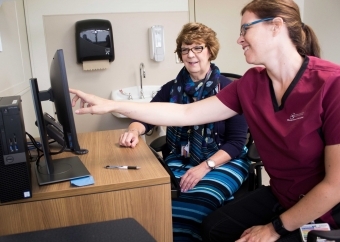 "Thanks to initiatives like the FAST acronym, we have seen an increase in awareness of symptoms and what to do if a patient is experiencing a stroke," said Niagara District Stroke Centre Co-ordinator Leanne Hammond. "Our goal is always call 911 when experiencing signs and symptoms of stroke." According to the Central South Regional Stroke Network, the Niagara District Stroke Centre has one of Central South and the province’s top rating for “time to first visit” following stroke symptoms. This is due in part to the Stroke Rapid Referral Clinic’s six-days-a-week operation. Patients’ first visit to the centre was within 1.2 days for the last quarter. The District Stroke Centre also holds one of the fastest door-to-needle times in the province. This is the time patients wait for the clot-busting drug tPA when they come to the Emergency Department with stroke symptoms. Patients suffering an ischemic stroke received the clot-busting drug tPA within an average of 35 minutes. Patients also receive tPA more frequently in Niagara than the average Ontario facility. More than one in five stroke patients (21 per cent) assessed with stroke symptoms were treated with the clot-busting drug compared with a provincial average of 12.5 per cent. Opened in 2010, the stroke centre treats more than 1,500 patients annually for stroke or transient ischemic attacks, or mini-strokes. Hammond and other representatives from the region will present a series of posters at the World Stroke Congress in Montreal in October. The posters will cover the topics of timely access to stroke treatment, access to treatment in a geographically large area like Niagara, and timely return to local stroke centres after stroke. Learn more about the Niagara District Stroke Centre and their vital work here. The FAST acronym is an easy way to remember the five signs of stroke. Time: To call 911 right away.